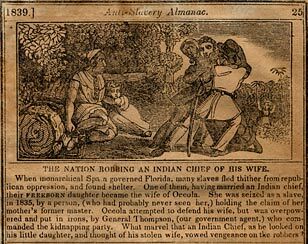 Engraving depicting the legendary kidnapping of Osceola's black wife. Published in The Anti-Slavery Almanac of 1839. The key images section contains a more detailed commentary on this image. Osceola's association with the Black Seminoles gave rise to a fascinating legend, one of the many that constellated around the chief. According to the story, Osceola was finally provoked to violence against the United States only after U.S. Indian Agent Thompson allowed slave raiders to kidnap his beautiful black wife in the summer of 1835. This story, circulated by abolitionists after 1839, has no known basis in fact. Scholars have agreed that it could have been true, given the occasional incidence of African-Seminole intermarriage, but it may well have been the fabrication of antislavery activists. Regardless of its veracity, however, the legend captured the essence of history, expressing the depth of the African-Seminole alliance.